PlayStation VR has enjoyed a lot of unique experiences, but a lot of games fall into a few specific categories. Namely, there has been a lot of arcade wave shooters since the new platform launched. Each of them brought their own unique flavor, but the core was the same. Ancient Amuletor seeks to add another layer to the genre by mixing elements of tower defense into the formula. The twist here is that you're the tower. You alone must teleport to the various stress points in the level and use different characters to manage the oncoming waves of enemies. 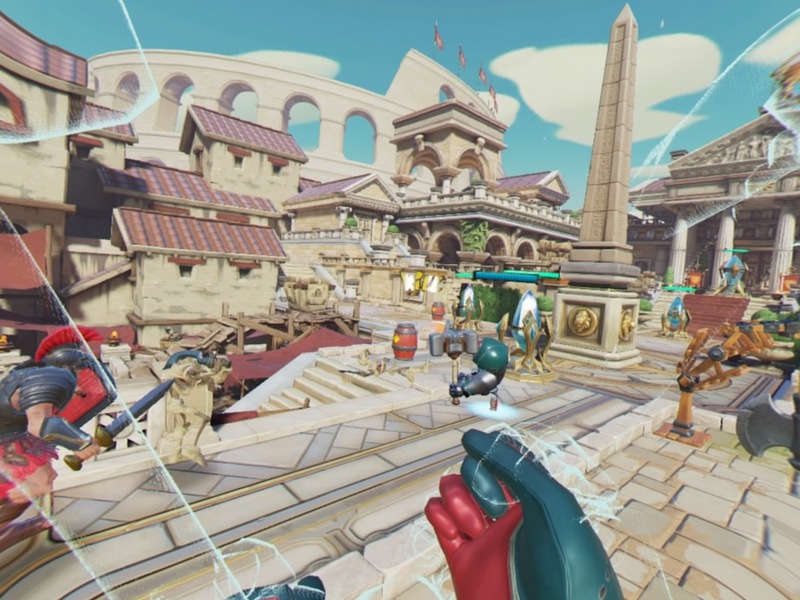 Does Ancient Amuletor Resurrect the genre on PSVR, or will it collect dust in your library like an ancient artifact? Time to find out! Ancient Amuletor doesn't have a story mode or campaign, but it does offer a unique combination of ancient history and fantasy elements. At launch, there are two areas to choose from which include ancient Egypt and the Roman Empire. Each area has two levels and a boss fight to run through. During your time playing, you'll fight against several different types of enemies that vary in difficulty. This is combined with four different heroes to choose from at launch. With options ranging from an archer to a mage, to a gunner, and even a puppeteer, there's a lot of unique elements at play here. It's a shame there's not more story, as these characters all seem like they would have excellent back stories based on their unique designs. I would have loved to see more story, even if it was just something cheesy or comedic, but as it stands there's not really any explanation behind the setting or characters. This can be forgiven, to an extent, if the gameplay is fun and engaging. Let's talk about the experience playing Ancient Amuletor. Ancient Amuletor is played exclusively with two PlayStation Move controllers and doesn't offer any other option for controls. The motion controls themselves are really well done and feel accurate for each of the characters. Using the Move button, you can teleport around the map as waves of enemies come out in real time. Your goal is to stop them from destroying several crystals on the map, so it's up to you to position yourself and attack accordingly. This is a unique take on tower defense, as normally these types of games have some sort of automated defenses, but here it's all up to you (or you and your friends in co-op). You can also switch characters on the fly, giving you a chance to change your strategy on the fly. The archer, for example, is excellent for picking off foes at long range. You'll use her bow with both move controllers, which is always an excellent control scheme. The gunner is great for mid-range and close-range combat. Her dual sawed-off shotguns pack a punch and flicking them up to reload them feels awesome. The mage can throw orbs of magic that is great for clearing out a group of enemies that may have snuck past your watch. Finally, the puppeteer offers a great way to get your hands dirty by throwing down a robot that you can control in real time to clear out a bottleneck. Each hero feels good to control and has a unique special ability that plays well to their abilities. I personally enjoyed the gunner's unlimited ammo ability. You'll find some power-ups you can shoot as well, along with explosive barrels that add some interactivity to the environment. On higher difficulties, the action gets crazy intense, and since motion controls are your only option, expect to get a good workout in. So, the gameplay here is great, but there is an elephant in the room we need to address. You've probably noticed that I used the term "at launch" several times. In the menus of Ancient Amuletor, you'll notice that some new areas and characters are blocked off. This is because the developers are seeking to add more content as DLC. As of this writing, it has been said that some free DLC is coming soon, but ultimately it seems like the rest of the game's new content will be paid. This would be fine if the price was a bit lower. Right now you're getting two areas (four levels and two bosses total), and four characters, for $20. The game does have multiple difficulties and an online co-op mode, so there's definitely value to be had here, but if the developers were planning on adding more content down the road, a different pricing model would have been beneficial. A season pass or something could have worked, for example, to ensure that gamers would get the DLC and that it would be paid for in the entry cost. The knowledge of upcoming DLC stings a little when the content that's here is a little thin for the asking price. That doesn't change the fact that what is here is excellent, though, so it is a bit of a double-edged sword. I was immediatley blown away by the graphics in Ancient Amuletor. I was playing on PS4 Pro and the style popped better than most other games in VR. Part of this could be attributed to the cartoon style that the developers chose, but it's clear there's a strong use of hardware here. The colors are bright and vivid, the animations are clean and smooth, and there's not a single jagged edge or rough texture to be found. It's possibly one of the best looking VR games I've ever played, hands-down. With some pretty cool twists on the gameplay and great characters, Ancient Amuletor does a lot of things really well. The $20 price tag hurts a little considering the small amount of content, and the fact that the developers plan to double the content through DLC, but it doesn't stop this from being a good game. If you're unsure about the price point, try the demo, and know going in that you're getting two areas and four heros (at least for now). Even knowing this, though, I expect you'll find that this game is an excellent example of what VR can do and how fun it can be.